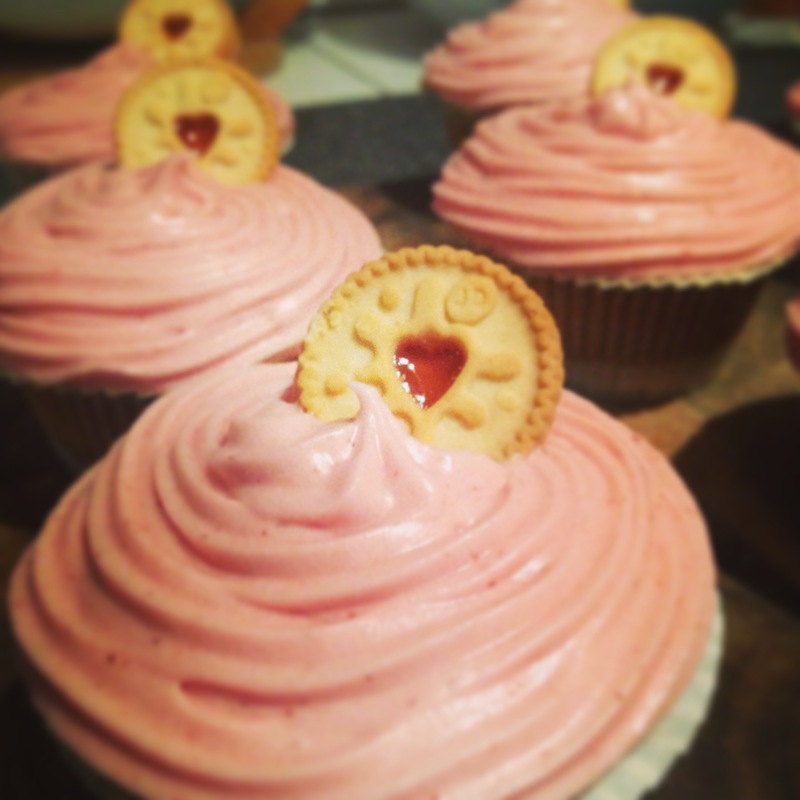 I decided on these scrummy treats, partly because I love Jammy Dodgers and partly because its the run up to Valentine’s Day! 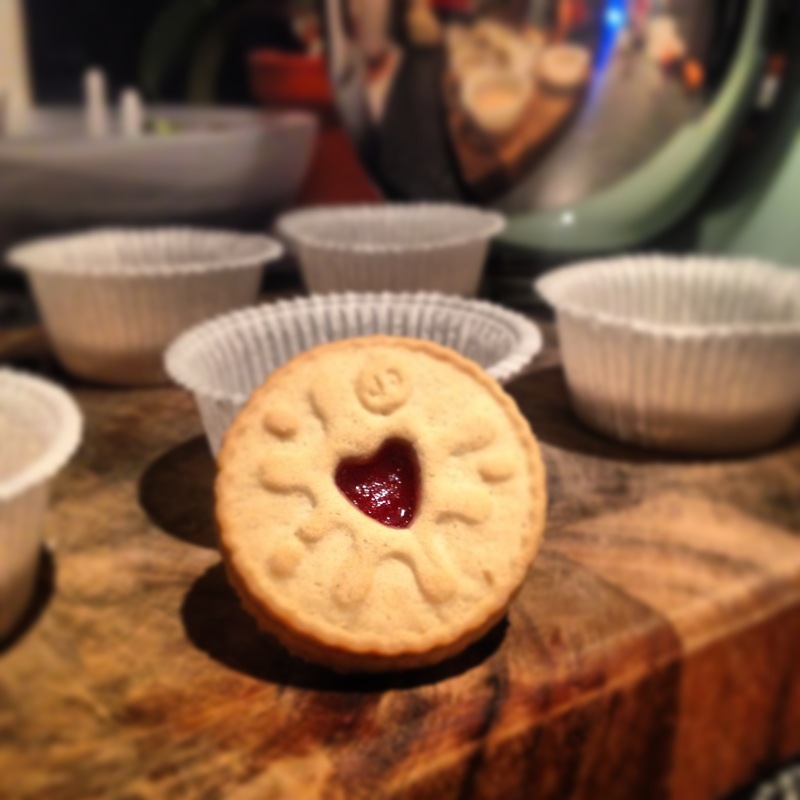 Even if you don’t have love for Valentine’s day itself, you still have love for Jammy Dodger’s, right?! 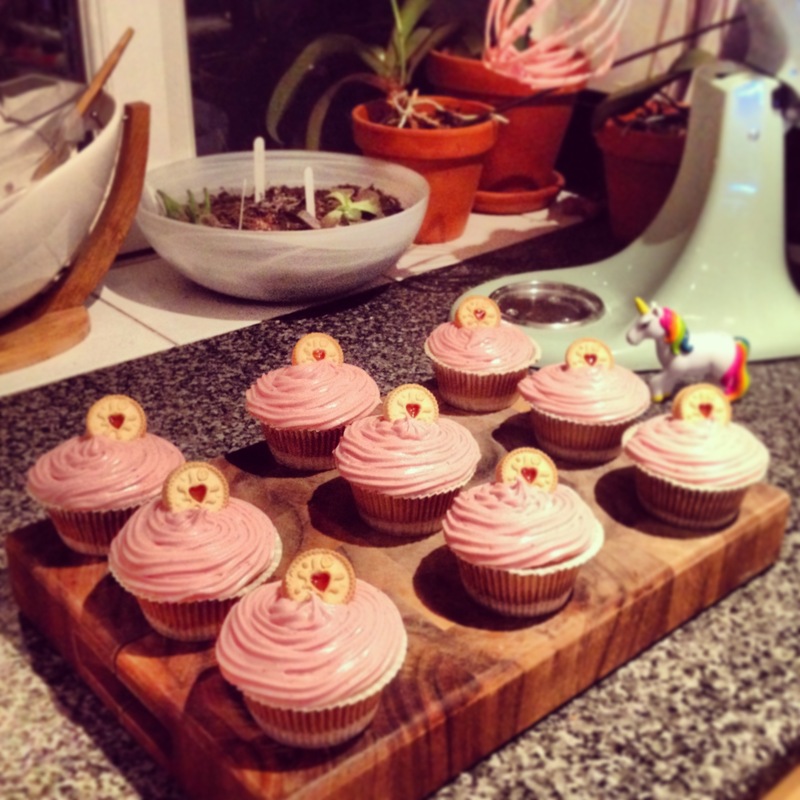 These cupcakes are pretty much cup-muffins, huge and very very sweet, not for the faint hearted! They look pretty though and will (hopefully) impress your friends and family 🙂 Give them a whirl and let me know what you think! 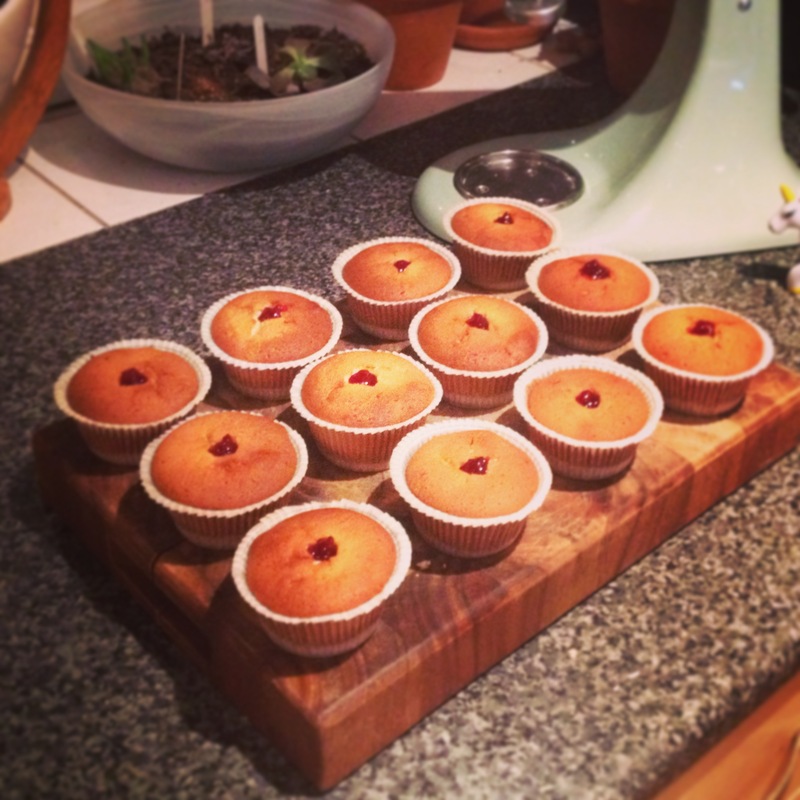 So….here’s the heads up – some bits worked, some bits need…..a little improvement! I’m ok with this, as the saying goes – we learn from our mistakes! 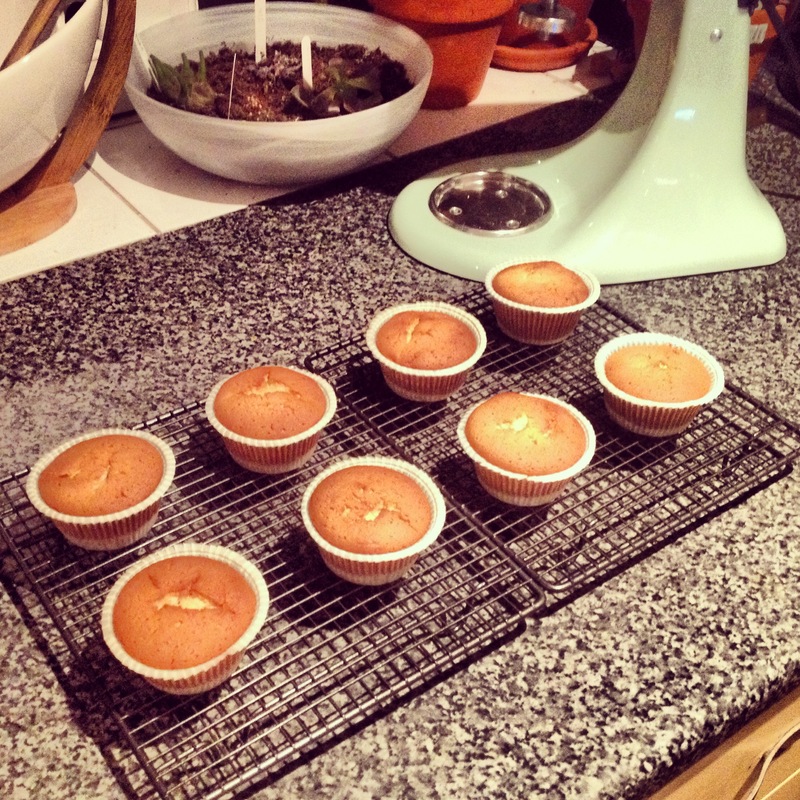 I was really happy with the cakes in general but when it came to the icing it was far too soft! Forgot the golden rule of not adding too much ‘liquid’ and so completely threw the mixture off when I added the jam in one go! 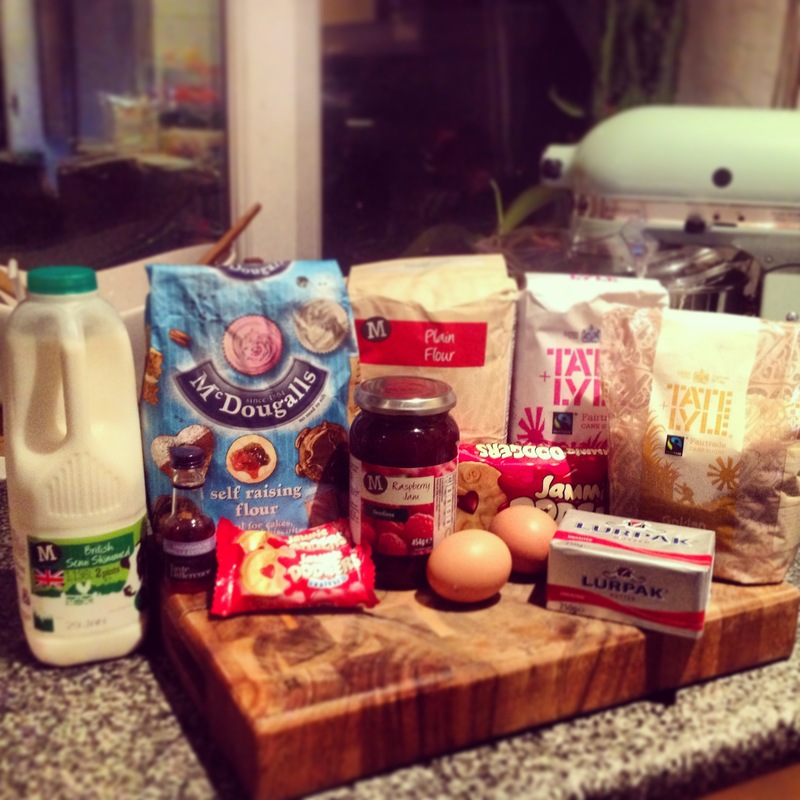 I managed to sort of save it and later found this really helpful hints and tips website for thickening different types of icing…. 1. 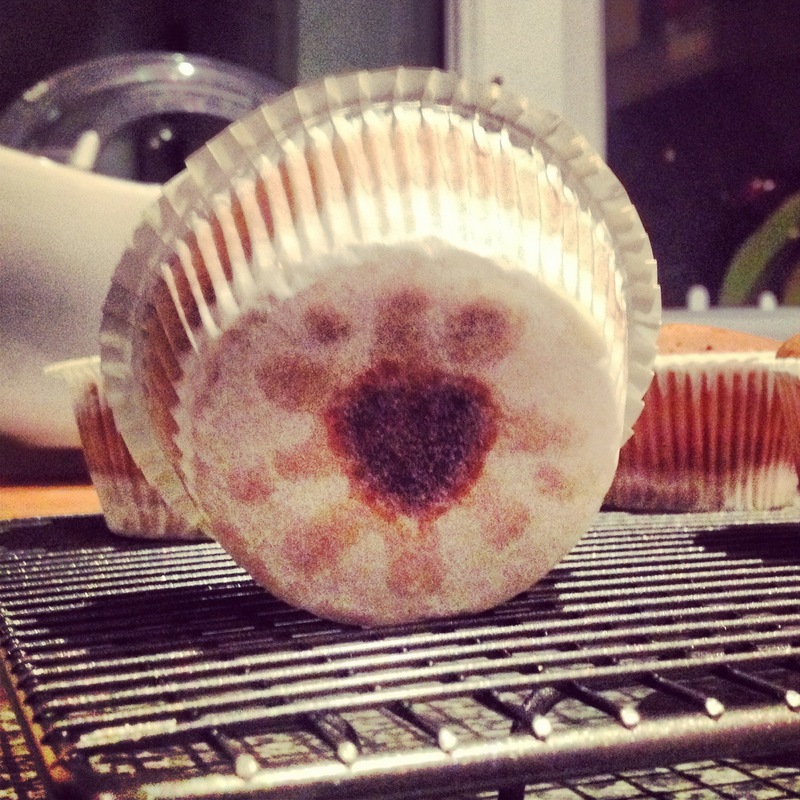 Place a jammy dodger ‘heart down’ in to the bottom of each of the muffin cases. 2. 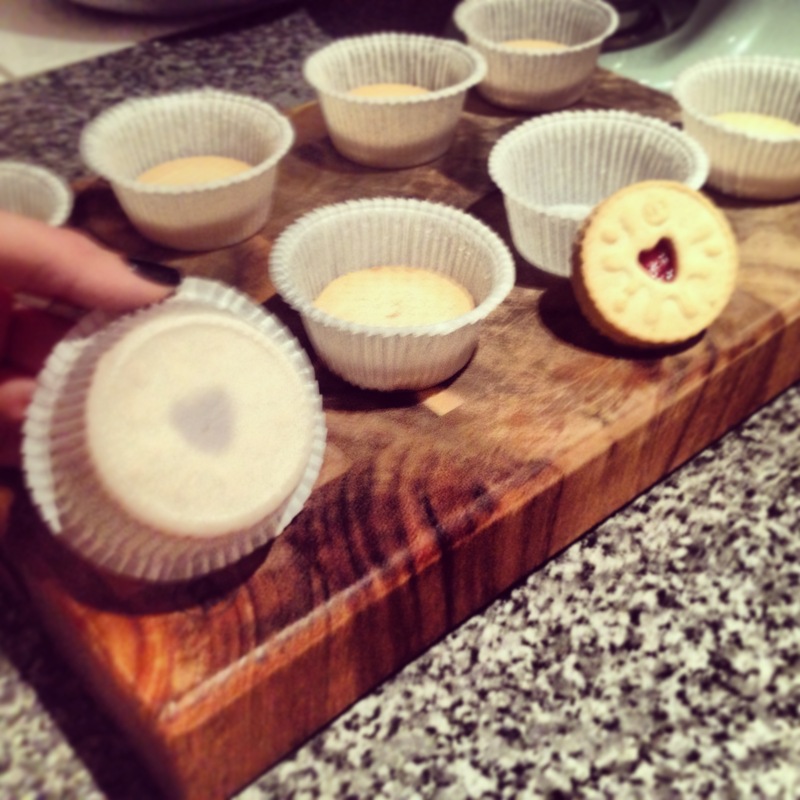 Preheat your oven to 180c or 160c (fan) and line a 12 hole muffin tray with the jammy dodger filled muffin cases. 3. Using an electric mixer, cream together the butter and sugar until light and fluffy. 4. Add the eggs, one at a time, mixing for a few minutes between each one. 5. In a separate bowl, combine the self raising and plain flour and put the milk in a jug with the vanilla essence. 6. Add 1/3 of the flours to the butter and sugar mixture, beat well. Add in 1/3 of the milk to the mixture and beat again. Repeat until all flour and milk have been added. 7. 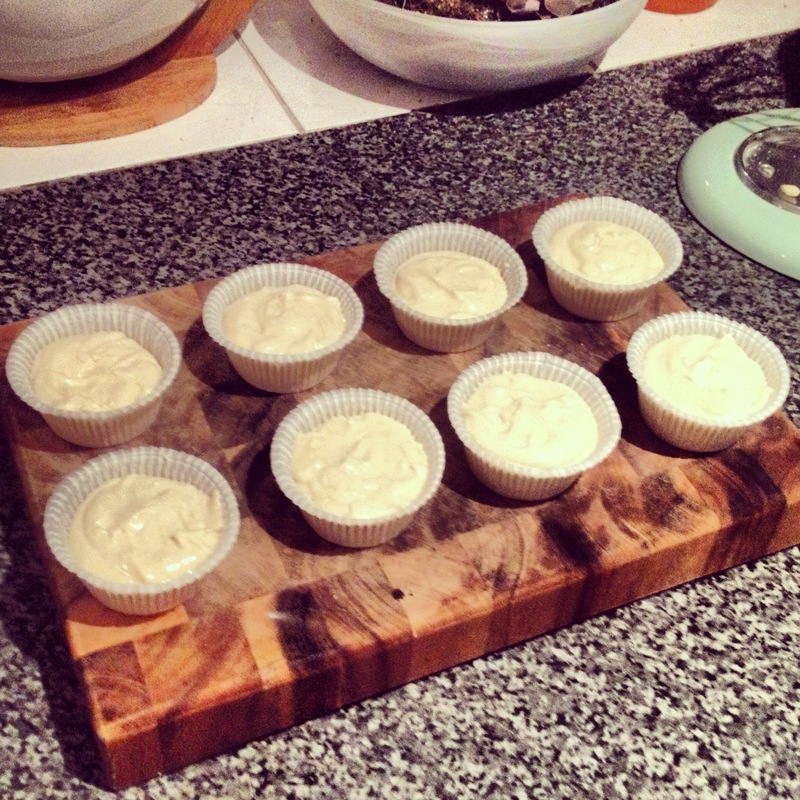 Carefully spoon the mixture in to the muffin cases – making sure they are about 2/3rd’s full. 8. Bake in the oven for around 25 minutes until slightly raised and golden brown. A skewer should come out clean after being inserted in to the middle of each cake. 9. 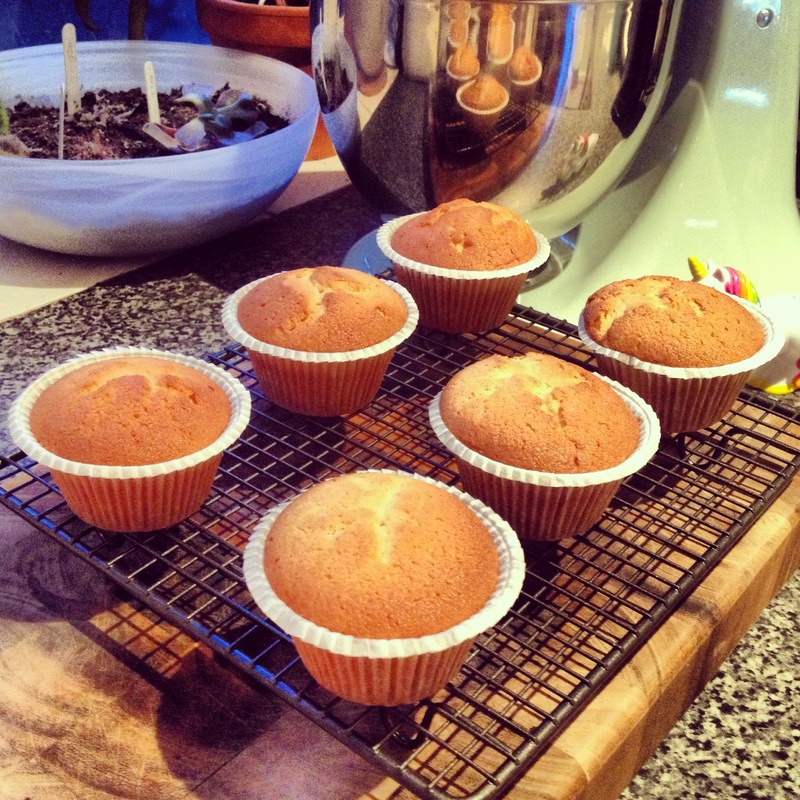 Remove from oven and leave cakes to cool for 5-10 minutes before placing on a wire rack to cool. 10. 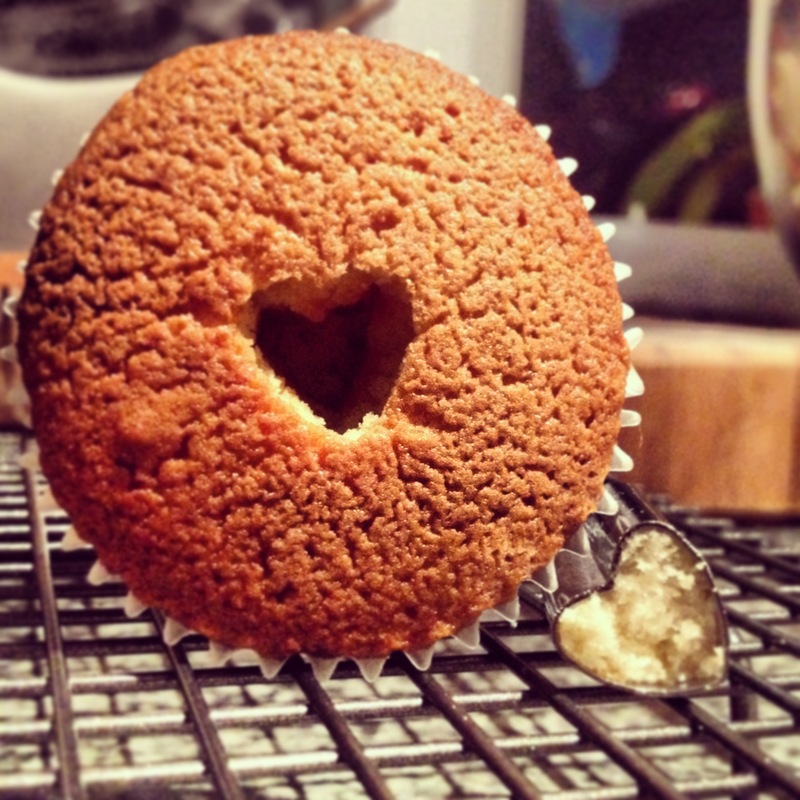 Once the cakes have cooled – use a shaped cake plunge, or a knife to cut a small hole in to the middle of your cupcakes. I used a heart shaped one. 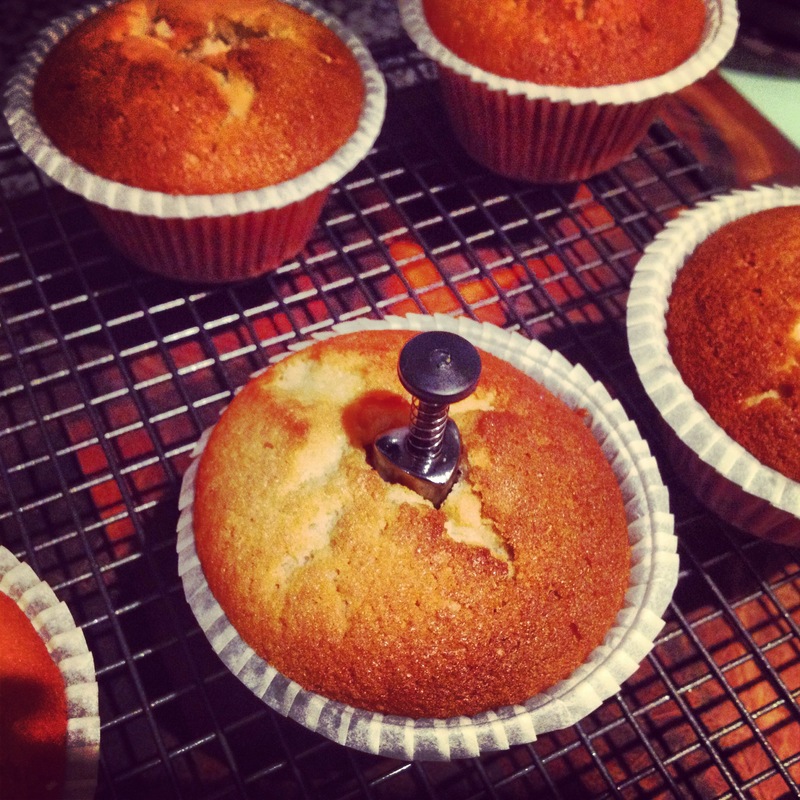 Tip: I find it easier to pipe the jam in – makes it a little neater! 12. Using a large mixing bowl and an electric mixer, beat the butter, milk, vanilla extract and half of the icing sugar until smooth. 13. Gradually add the remainder of the icing sugar and beat again until the buttercream is smooth and creamy. 15. Spoon the mixture in to a piping bag and decorate your cupcakes as desired. 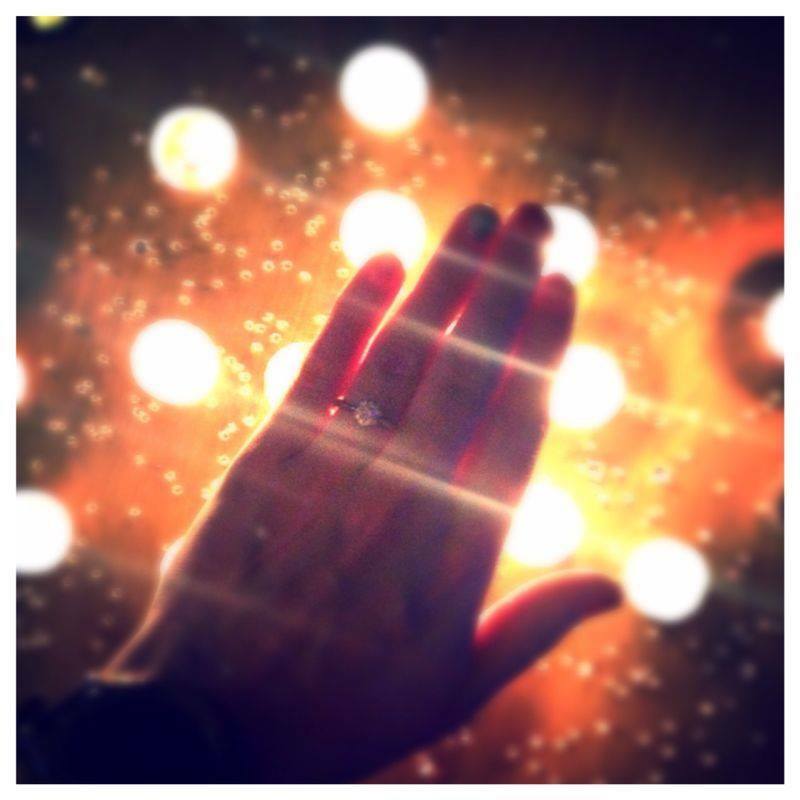 Recently, two very lovely friends of mine, Kate & James got engaged! Congratulations! We had the lovely pair over for dinner at ours on Saturday night and Dave cooked an amazing dinner. 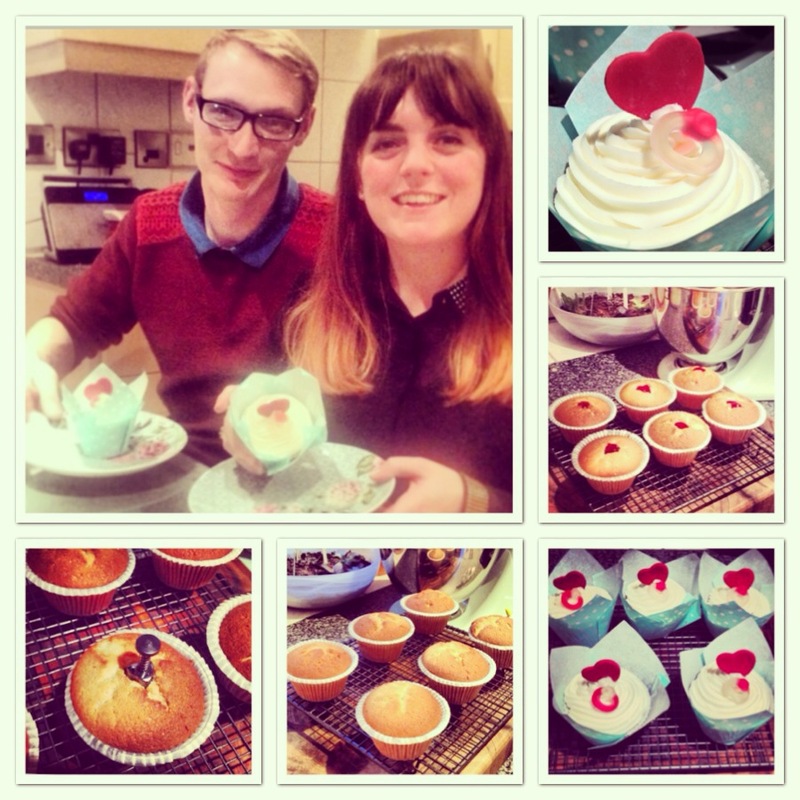 To start we had, Jamie Oliver’s Camembert stuffed with garlic and rosemary, followed by Tom Kerridge’s slow roast shoulder of lamb with boulangère potatoes and for dessert I had knocked up some cute engagement themed cupcakes! I decided to keep it simple as we had so much rich, french food on the menu and I didn’t want to overwhelm our guests with mountains of food! I stuck with my standard vanilla cupcake with strawberry jam in the centre – my new favourite cupcake addition – and a plain vanilla butter cream (from the Primrose Bakery book) before decorating with red icing hearts (that had been cut a good few hours before decoration to allow them to stiffen) and haribo ‘engagement’ rings! 1. 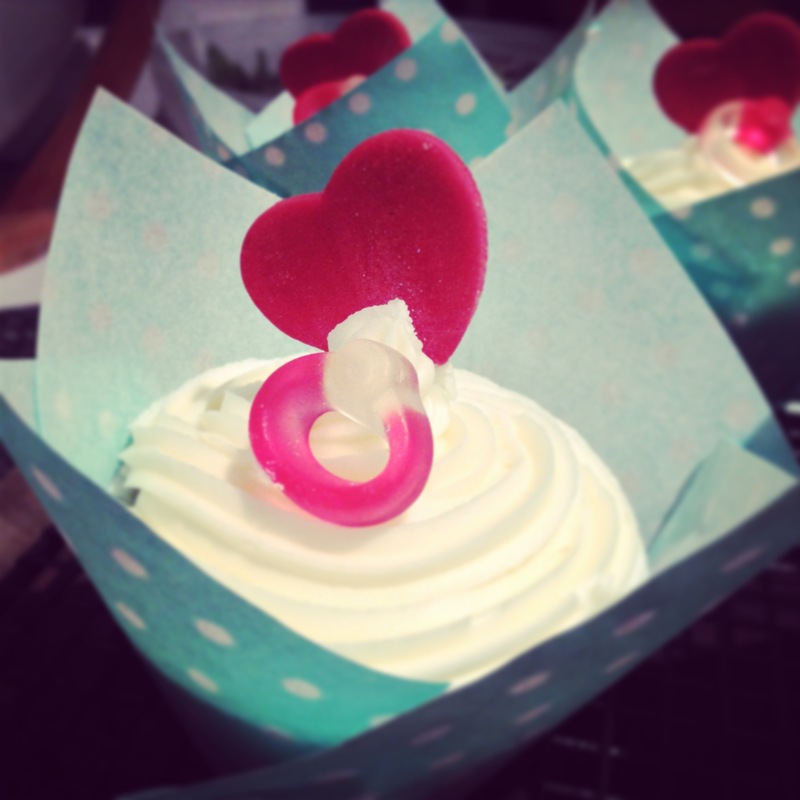 Roll out your red icing and using a heart shaped cutter, cup out the required number of hearts needed for your cupcakes. 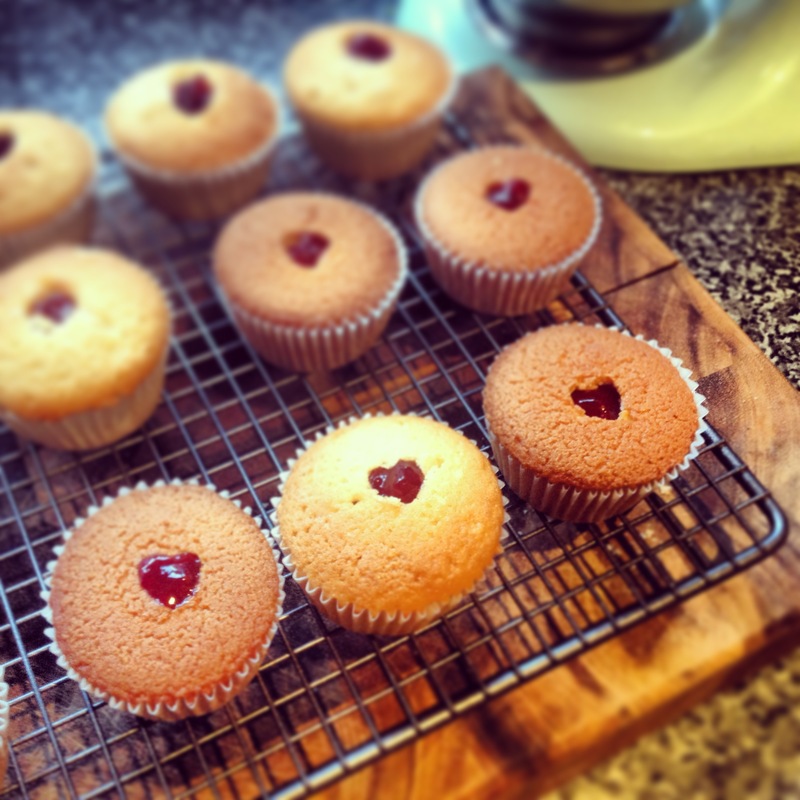 Tip: The longer you can leave the hearts to dry and stiffen, the better – preferably over night. 2. 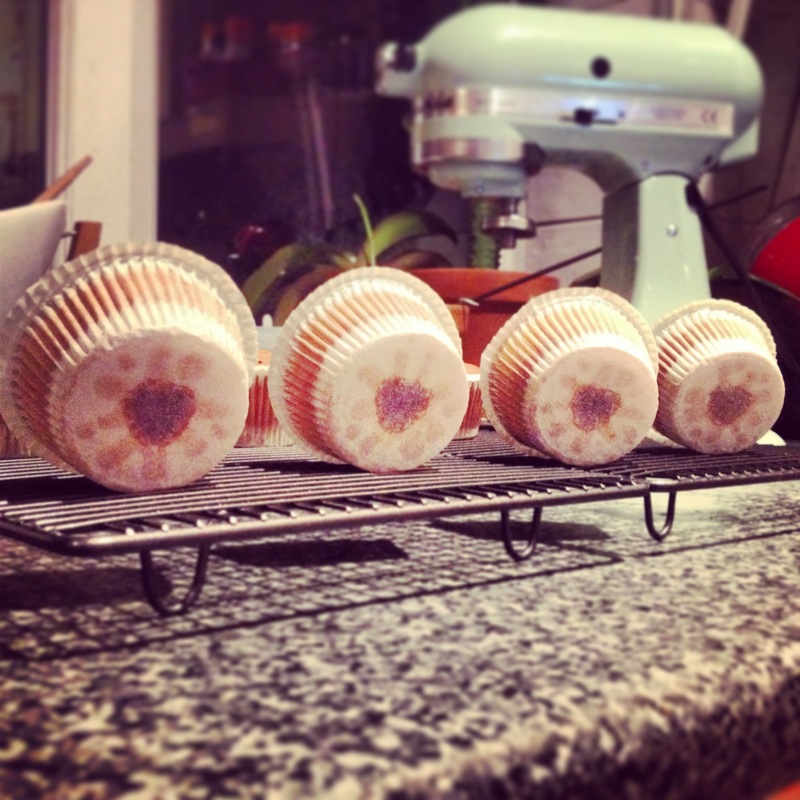 Preheat your oven to 160c and line a 12 hole muffin tray with cupcake cases. 7. 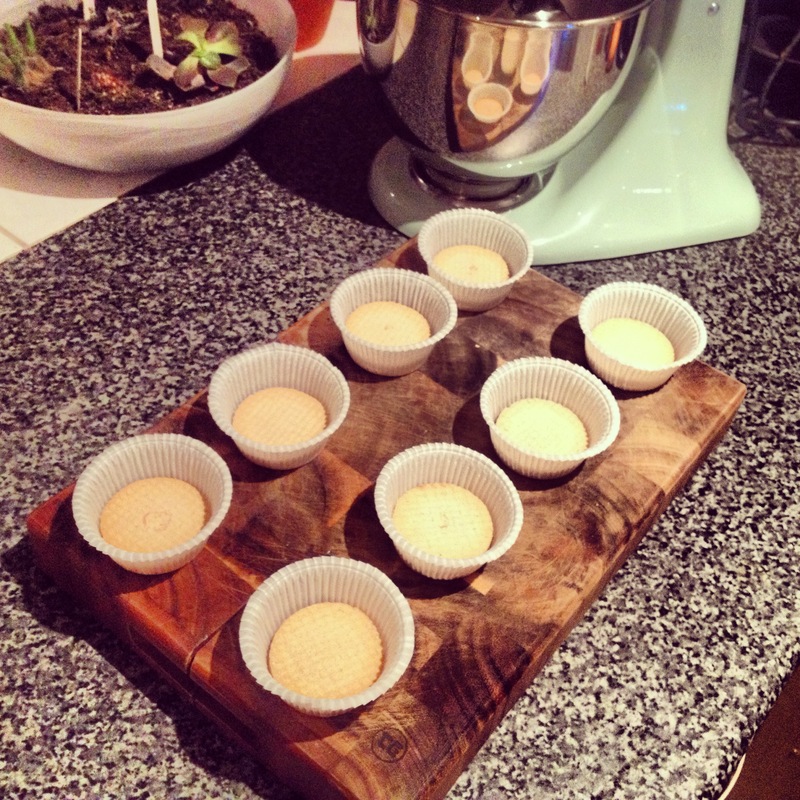 Carefully spoon the mixture in to the cupcake cases – making sure they are about 2/3rd’s full . 8. Bake in the oven for around 25 minutes until slightly raised and golden brown. A skewer should come out clean after being inserted in to the middle of the cake. 14. Spoon the mixture in to a piping bag and decorate your cupcakes as desired. 15. 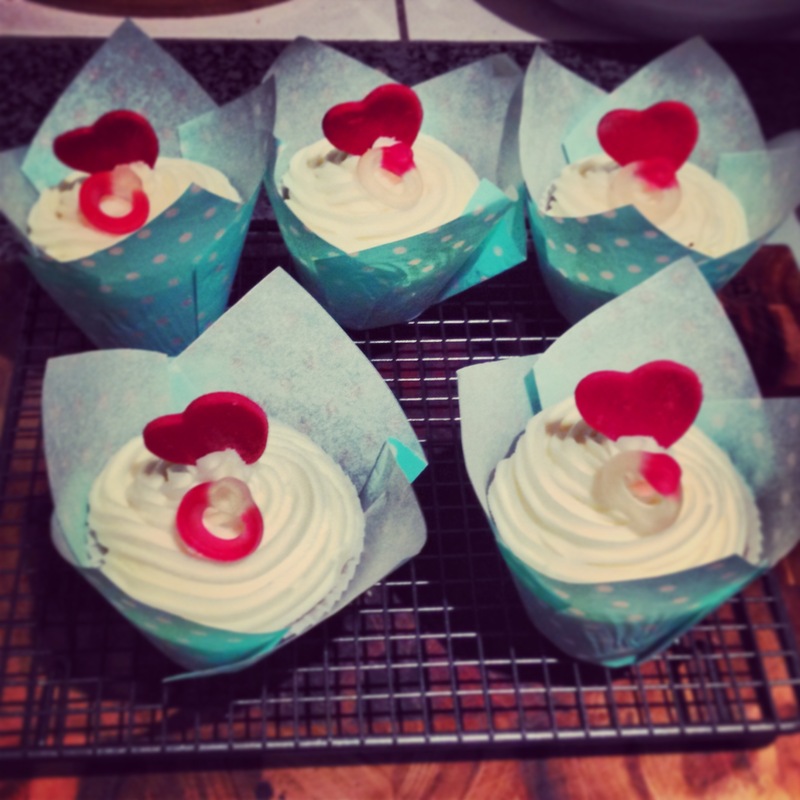 Decorate by placing the red icing heart and a haribo ring on to your cupcake!